Dr. Dinesh Taylor is working with our disaster assistance response team in Nepal after the deadly earthquake. In disaster relief, time is crucial. Lack of food, water, shelter, or communication puts lives on the line. Especially with the threat of monsoon season, every hour counts. It was vital to reach the remote districts in northern Nepal soon to determine how we could best serve the residents who had not yet been reached. No aid had been brought to the regions of Jharlang, Tipling, Sertung, or Lapa; lack of roads and dangerous mountain trails had blocked anyone from getting to the residents. On Friday night, a Samaritan’s Purse team loaded 10 large trucks full of blankets, kitchen items, and food to take to a village in the mountains. Our plan was to distribute the supplies, and then I would visit one more village to talk to residents about their needs. After a tumultuous ride to the village and a successful distribution, it was time to visit the next village. The road had ended, so our only choice was to trek. “How long will it take to get to the village?” I asked my Nepali partner. “Just fifteen minutes,” he confidently replied. My pack loaded with medicines was so heavy that local porters decided it was too heavy for them to carry. So for 15 minutes, I would have to ask God for strength. With the loaded pack on my back, we began the near-vertical trek up the beautiful, but dangerous, Nepali mountains. With burning muscles, an aching back, and sweat running down my face, I carefully placed one foot in front of the other, trying to avoid loose rocks and cracks from the earthquake. Soon, the 15 minutes seemed too long. After checking my phone, I realized that much more time had passed. “Just fifteen more minutes,” my guide assured me. This bridge is the only one connecting remote mountain villages to the bigger towns accessible by car. You can see evidence of landslides on the trail. 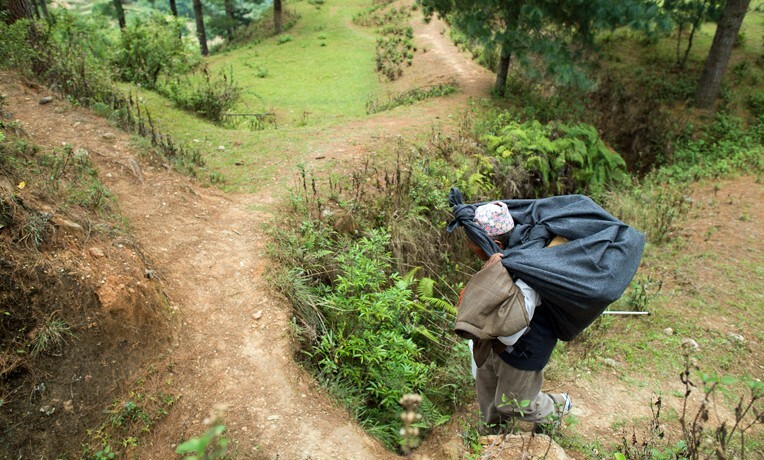 But landslides had wiped out trails that had operated for decades, so he was unsure. Any additional distance on a trek like this one isn’t easy. Evidence of landslides surrounded us, piles of debris marked where houses once stood, and gorges were ominous. This trail was dangerous and fraught with earthquake devastation. Again, I asked my guide how much farther. He kept promising a quick arrival. But trails were destroyed and landmarks lost; he was now operating on Nepali time. After six hours, we reached a village and stopped to eat whatever they could offer us. I lay down in a small shack. Closing my eyes in weariness and frustration, I wondered why I was here. Why had I given up an established, comfortable life to wander on this dangerous and treacherous mountain range? I opened my eyes, and above me I noticed a piece of cardboard with “Samaritan’s Purse OCC” printed on it nestled into the ceiling as insulation. That was it. Like the Samaritan who put his life aside to love and care for a stranger, so had God put me here—hungry, thirsty, and lost in the Nepali mountains to care for fearful, sick, and struggling earthquake survivors. We reached our destination for the night at 8:30 p.m., after walking on the dangerous dark trails. We continued on for three days of walking. I have never experienced such painful body aches as I did in those days. Nor have I been more fearful of my life. But in every moment, I kept praying. Only through prayer was I able to make such a journey. And along the way, God gave me reminders of His provision and calling. One day, after word was spreading of help finally arriving, a man ran up to me on the trail and grabbed my arm. “Thank you for coming,” he said eagerly before running ahead to his village. Devastated survivors were grateful to finally receive help. Moments like these reminded me that God enables us to do all things to exhibit His love. His strength kept me trekking through the pain, hunger, thirst, confusion, and danger. Although those “15 minutes” of Nepali time were the hardest of my life, I would go through it all again.